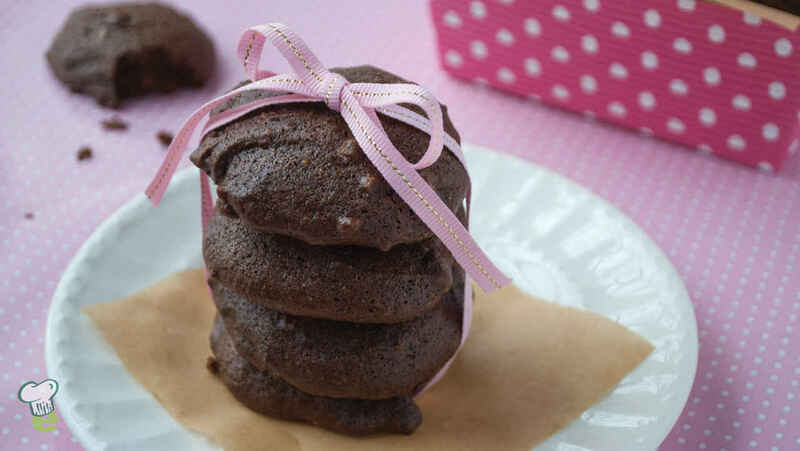 These chewy chocolate cookies get a double chocolate dose with cocoa powder and unsweetened chocolate. The egg whites make them light and airy for low fat, low calorie cookies everyone will love. Preheat oven to 350°. Line large baking sheets with parchment paper. In a medium bowl, combine flours, cocoa powder, baking soda and salt. In a large bowl, beat egg whites with an electric mixer until foamy, about 1 minute. Gradually beat granulated sugar into egg whites. Scrape down the sides of the bowl and beat in brown sugar until smooth, about 3 minutes. Beat in vanilla and melted chocolate. Drop batter by tablespoonfuls onto prepared baking sheets, 1 1/2 inches apart. Bake until flat with slightly cracked tops, 10 to 12 minutes. Cool on baking sheets for 5 minutes, then transfer to a wire rack to cool completely.